Like many of Vietnam's numerous beautiful festivals, the Mid-Autumn Festival is rich with history, culture, and meaning. In the past decades, however, these familiar traditions have given way for the encroachment of modernity and the commercialisation of its customs. Where it was once celebrated only on the 15th day of the 8th lunary month, the festival has now become a month-long gift-giving frenzy, overshadowing its old principles of higher values and education, togetherness, and quiet celebration of the family. Originating in China, the Mid-Autumn festival found its humble beginnings in the celebration of the full moon night that marks the end of the autumn harvest. It is said that this occasion commemorates the uniting of relatives, parents and children after a long and busy period of harvest, when they can spend meaningful time together as they celebrate the harvest and the full moon, the roundness and brightness of which symbolise the fullness of unity and the prosperity of life. Families gather and make offerings such as wine, fruits, and mooncakes to the heavens to express gratitude for the harvest. As such, the festival is traditionally very important to families, friends, as well as lovers, who take the occasion to reunite under the clear and beautiful full moon. In worship of its beauty, it is traditionally customary to write poems, handmake lanterns, and share moon cakes. Today, centuries after the festival's conception, we at Authentique would like to encourage you to go back to those simple yet profound moments of singing children, handmade paper lanterns, and sitting around a table with your family and friends, meaningfully sharing in the gratitude for the abundance of life and love over freshly brewed Vietnamese tea and luscious moon cakes. In the spirit of unity and deep appreciation, we are delighted to offer you our delicious orange-ginger mooncakes* and our handpicked, exclusive seasonal specialty tea: a rich and earthy Jasmine blend from Thuong Tra. 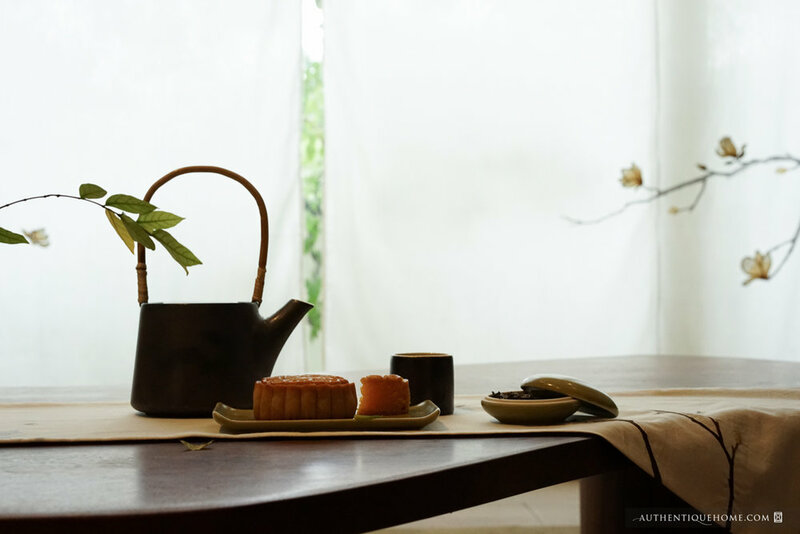 Combined with one of our beautiful Authentique tea sets, the tea and cakes will complement any home with an elegant simplicity and tranquility that reflects the dignified traditions and values that made the Mid-Autumn the beautiful and culturally meaningful festival that it truly is.